Renal ischemia, hypoxia and oxidative stress progress together over the course of renovascular disease, and thus appear to operate in a vicious pathological triangle. 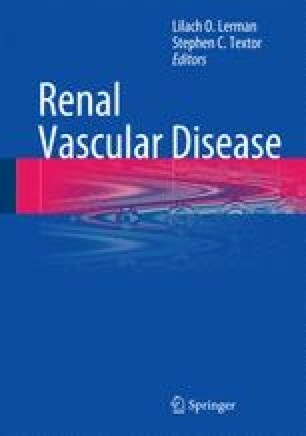 Renal ischemia is initially driven by the mechanical effect of the stenosis, and maintained in the medium term chiefly by activation of the systemic and intrarenal renin-angiotensin systems. In the longer term, ischemia is exacerbated by inflammation, fibrosis and microvascular rarefaction, at least partly driven by signaling cascades initiated by oxidative stress and tissue hypoxia. Oxidative stress in renovascular disease is initially driven by activation of the renin-angiotensin system, but other factors, such as the pro-oxidant effects of uremic toxins, likely also contribute in the longer term. Oxidative stress drives ischemia by the direct vasoconstrictor effects of reactive oxygen species such as superoxide, and through reduced bioavailability of the vasodilator nitric oxide. This microvascular dysfunction appears to be a major driver of microvascular remodeling and rarefaction. Ischemia drives tissue hypoxia by reducing oxygen delivery to tissue. Oxidative stress and the resultant reduction in nitric oxide bioavailability also promote hypoxia by reducing the efficiency of oxygen utilization in mitochondria. Reduced glomerular filtration leads to reduced renal oxygen consumption, so provides some protection against the development of tissue hypoxia, at least in mild or early stage renovascular disease. But, eventually, homeostasis of tissue oxygenation cannot be maintained, and tissue hypoxia ensues. The authors’ work has been supported by grants from the National Health and Medical Research Council of Australia (143603, 143785, 384101, 606601 & 1024575) and the American Heart Association (10SDG4150061).